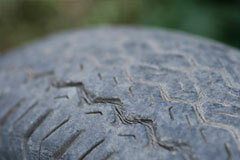 Wrongful installation of New Tires on the Front Results in Legal Claims. Brought to you by The Brain Injury Law Group - No Charge Unless We Win. Gross axle weight ratings (GAWR) for front and rear axles: the maximum weight the axle systems are designed to carry. Manufacturers of passenger vehicles and light trucks determine this number based on he vehicle's design load limit, that is, the greatest amount of weight a vehicle can safely carry and the vehicle's tire size.The proper tire pressure for your vehicle is referred to as the "recommended cold inflation pressure." The vehicle manufacturer's recommended tire inflation pressure is the proper psi when a tire is cold. The term cold does not relate to the outside temperature. Rather, a cold tire is one that has not been driven on for at least three hours. When you drive, your tires get warmer, causing the air pressure within them to increase. Your tires can get warm after just 1 mile of driving.